Did you see that number? 47? With the dumping of Biosolids in our area from the Lower Mainland our members plan to protest as individuals as well as preparing a resolution to send to the Provincial WI. Biosolids are the treated, stabilized solids resulting from wastewater treatment and are regulated under the BC Environmental Management Act and Health Act. Stay tuned for more from Nicola Valley WI for updates on this issue. From the Douglas District, Pemberton WI look forward to WI Week in February when they hold a potluck and annual “fun auction”. Pictured below are the members and some 64 dozen Christmas Cookies. Marnie Simons & hostess Judith Walton. Atchelitz WI celebrated their 100th Anniversary on September 6th. Because of the continued support of the community at fundraising events, they were once again able to donate to many local charities such as The Ride to Conquer Cancer, Salvation Army Food Bank, Chilliwack Hospice Society, BC Agriculture in the Classroom, Pacific Riding for Developing Abilities, Ann Davis Transition House & Sardis Doorway, just to name a few. Over in Kamloops District, Overlander WI continued their support of local charities. For example, they gave p.j.’s and toiletries to the YWCA Women’s Shelter. Coldstream WI from the North Okanagan Sushwap District declare themselves to be a “crafty bunch.” I’d say they are a compassionate bunch too. 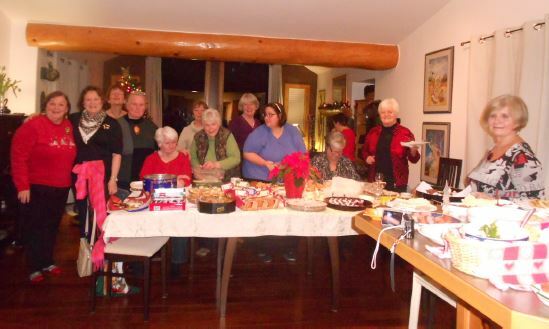 They gathered “gifts of hope” for the clients of the Canadian Mental Health Association. Among several community support activities, Gabriola WI from the north end of Vancouver Island made donations to their local 4H club. At the south end of the island, Colwood WI had a busy year. They were fortunate to be involved in several community events last Fall. For example, the women provided Christmas gifts for the residents of Cockerel House. This is a home for injured Veterans and Colwood WI is proud to able to support the vets in their recovery. Claude of Cockerel House receives the Christmas gifts from Carol. Langford WI’s report was a series of images. I’ve arranged them in a gallery here. Hover or click for captions. President Gloria Ridgway & Past President and grandmother, Marie Ridgway.